I have chased with many different tour guides now and they all have had different personalities and guiding styles. We have the calm and informative style of Charles Edwards and Brian Morganti or the friendly and dedicated style of Gene Robertson and Allan Dietrich. They were all excellent tour guides but I really loved chasing with Lanny Dean. People sometimes ask me what I find so interesting about storms. I am always a bit surprised by the question, like “How can you not be fascinated by tornadoes?!”. I guess everyone would find a full contrast, destructive tornado fascinating but we all know storm chasing is not like that every day. What makes every day special is the build up, the growing excitement, the let-downs and surprises, and the clues the storms gives you it might produce something spectacular. That is why you can look at dark coloured, condensed water in the sky for hours – with an adrenalin rush. Often, you have no idea what you are looking at, what might happen or if you have any reasons to be excited – and that is what Lanny Dean brings to the storms. He has seen some 300-400 tornadoes I think but is still over excited about inflow, possible funnel clouds and wall clouds and he really brought that passion (and knowledge) to us guests. Below is a video I just put up on Youtube that was filmed on our only real chase day of the unlucky tour of May 2014. 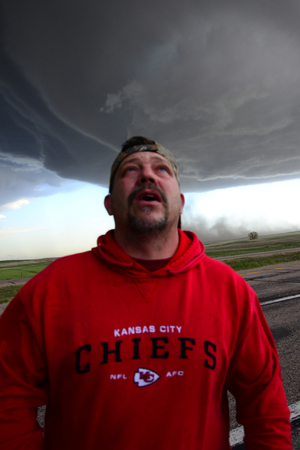 We saw an anti-cyclonic land spout tornado that day (not in the video) but nothing else really, it still was a spectacular day thanks to the excitement and passion brought by Lanny.